Quick, what is this a picture of? OK, most of my friends know me – I am not a major soda drinker. Every now and then, I may indulge – usually when at a restaurant and the other options are dismal. Sometimes though, I want a real Coke. 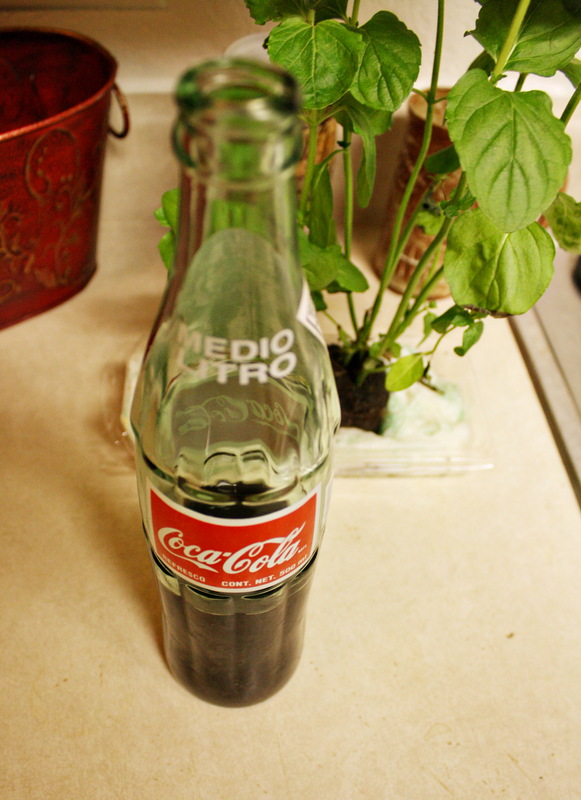 Not Diet, not New Coke, not Coke Zero… I mean The Real Thing, the Coca-Cola Classic. Can’t beat it! The thing is, I remember what Coke used to taste like. C’mon, if you’re over a certain age, you know what I mean. Does it taste the same these days? The folks at Coca-Cola will try to tell you it does. A lot of folks would say the same. And ummm…. The thing is, somewhere along the line, Coke started making their product with corn syrup. Now I’m not jumping on the Corn-Syrup-Is-The-Devil bandwagon, but… it don’t taste the same! But… Coke products made in Mexico still have that all important little ingredient called “sugar” – as in “Pure Cane Sugar”. There I am indulging in a rare treat – Mexican food from the local taco shop. Don’t knock it, it’s good! At which point, I’m thinking: yes, and that is exactly why I want the thing! Then he proceeds to ask me if I need it opened, because they’re not twist caps. Umm… nope. I have a bottle opener at home thanks! And oh, did that Coke taste good! It’s a little trip down memory lane… and having had both the modern-day, US-market Coke and the Mexican-made product, all I can say is…. Damn right it’s not the same. They use sugar in Ireland and elsewhere in Europe. I suppose it’s only a matter of time before they screw that up too. I was never much of a soda drinker but the corn syrup muck put paid to the little I did drink. I shall revel in sugary stickiness next time I’m in Mexico though. For old times sake. OMG! I miss that! I used to LOVE Coke, till they changed it, your right it isn’t the same. Now I have to have my brother-in -law bring me some home next time he goes there! I’m sooo jealous.